Tower Ranch Golf and Country Club has been voted number one golf course in Kelowna by the CPGA of British Columbia, which is a very nice compliment coming from golfing professionals. In 2009, SCOREGolf Magazine and Golf Digest listed the course in the top three of the best new Canadian golf courses. Once again, another fine compliment. Neil Schmidt, director of operations at Tower Ranch, said, “I have been here since inception and we pride ourselves in what we have accomplished.” Schmidt should be proud. Stan Tower was a farmer, rancher and amateur pilot who in the 1960s made his home in the East Kelowna Uplands, a short drive from downtown Kelowna. As the years passed, Stan envisioned a planned residential community on his property, co-existing with the rugged mountain terrain. In the 1980s, Stan met golf architect Thomas McBroom and his longtime dream was launched. Tower Ranch opened the front nine in May 2008 along with phase one of single family homes. The back nine was opened in July of the same year. On completion, 800 homes will share the former Tower Ranch. Dilworth Homes, the builder, adds six to eight homes each year to the development. Tower Ranch reminds me of Tobiano near Kamloops, B.C. Both are links courses and designed by Thomas McBroom. This mountain course is shaped by its topography, cut into the hills and gullies, with plenty of fescue grass in a semi-arid climate. Of the 18 holes, 16 have elevated tees. Water comes into play only on No. 2, 7 and 10. Hole No. 1, a par four at 423 yards from the back tees, and hole No. 2, par five at 564 yards—all downhill—are two of the best opening holes in golf anywhere. These two holes allow golfers to ease into the game before tackling the harder holes. The two par threes are relatively short and it is paramount to hit the green and avoid the hazards. Hole No. 6 is the number one handicap hole, a long par four at 487 yards, with a narrow fairway and sunken green. The last two holes are uphill with false fronts, allowing the ball to run backwards off the greens. The back nine holes continue to climb up into the hills, with panoramic views of Kelowna and Lake Okanagan. Hole No. 10 at 419 yards has water up the right side. The back par threes have you hitting across a gully or down into one. On 13 and 15, your drive has to carry the gully to find the fairway. The course has two excellent finishing holes. The 17th is 583 yards, the second handicap hole, and ends with an elevated green. From the green it is possible to look down on the Kelowna airport and see five other golf courses in the valley. Neil Schmidt described the view from this green as spectacular, and it makes you feel like the king of the castle. The 18th hole is 446 yards, a dogleg par 4 four with a sunken green. It’s an easy finishing hole if you avoid the bunkers. As for the greens, they are bent grass, undulating and tiered, which makes putting a challenge. 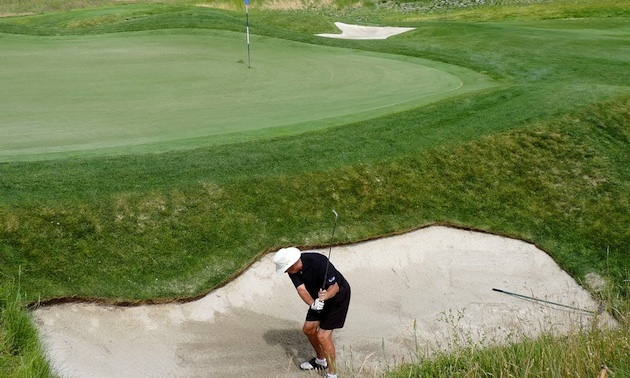 There is an abundance of deep sand traps with white silica sand. The well-equipped and classy clubhouse with 10,000 square feet contains a pro shop, fitness facility and homeowners’ lounge and restaurant. Private and corporate memberships are available, making this course semi-private. The restaurant/lounge is named after its corporate owners, Carrington Group of Companies based in Edmonton. There is no driving range or teaching academy, but warm-up nets are available along with practice putting greens. This course may not be for everyone, being rated so highly, but remains a challenge for a golfer of any skill level. Tower Ranch is a premier course that requires skill to avoid the fescue grass and hazard areas, as well as playing in the wind. If you visit Kelowna, Tower Ranch has to be added to your list of places to play.